You might have been wondering: “Neil, what on Earth have you been doing for the past year? You’re always up at the weirdest hours and can’t seem to carry on normal conversations anymore!” Well, out today is a paper on one of the projects that’s eaten up several of those months, and about 5,000 years of CPU time: Investigating the Performance of an Adiabatic Quantum Optimization Processor. It’s been in the works for years, with Geordie working to get the ball rolling and keep it rolling on the necessary Quantum Monte Carlo (QMC) simulations. Firas Hamze, Kamran Karimi, and I worked full-time for months to solve dozens of undocumented issues that came up in pre-processing, processing, post-processing, and managing such large-scale simulations on thousands of volunteers’ computers, and Mohammad Amin filled in some critical missing pieces of theory needed to get actual times for a quantum processor (as opposed to dimensionless, time-like quantities). I’d like to summarize here some of what goes into a round of our simulations and some of the issues that crop up. There are some major items needed before sending off any simulations over BOINC for our gracious volunteers to help us out. Probably the most obvious (so much that it’s easy to miss) is that we need something to be simulated. In our case, the objective was to simulate a very low temperature quantum processor (0.00075 degrees above absolute zero, about 27 times colder than the actual chips) solving a particular class of random NP-hard problems very slowly, and gather enough data from the simulation to predict the required time (known as the “adiabatic time”) to get a 63.2% success rate (i.e. ) with such a processor. We called these problems “UH-1”, short for “Ultra Hard 1”, since we noticed that they were much more difficult than expected for IBM’s CPLEX, a standard commercial optimization program. …or something like that, I can’t remember if that’s the exact equation off the top of my head; it’s posted on my wall at work. Edit: Updated; I think it’s the right one now. Anyway, in order to make use of these concepts, we need a simulation program, it needs to be correct, and it can’t take the age of the universe to get back to us. Also, in order to make this simulated processor a reasonable analogue of a real processor, we needed the real processor to be characterized. Since we didn’t need to simulate any real dynamics or noise in the processor, just static properties, we only needed the relevant energy scales throughout a computation and the layout of the chip. Last, and definitely not least, 5,000 years of CPU time doesn’t just fall out of the sky. We had to build up a community of volunteers interested in helping us on BOINC and make sure our app plays nicely with their computers. They’re doing us a huge service, so the last thing we want is to be a burden. To put things in perspective, I checked how much it’d cost to have done the same using rented server time on Amazon EC2, and it worked out to be around $4M to $5M, money we simply don’t have. One thing that we struggled with for ages was making sure that if we tell it to simulate something, it’s actually simulating that instead of it being in the process of heading toward simulating that so slowly that it never actually starts simulating the right thing. That’s a very cryptic was of saying “it’s even hard to figure out where it should start”. One part of the solution to this is to simply let it simulate for a while without looking at it, hoping that it’s heading toward a good starting location. 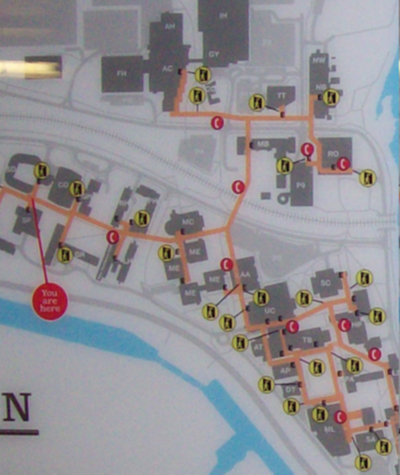 If you wait infinitely long, it will end up at a good location on average, but we don’t have that kind of time. We used the fact that near the end of the computation, a successful computation will have the system near the correct solution to the problem, and farther from the end of the computation, the simulation can get into a rough approximation of the right distribution in a reasonable amount of time (a few minutes). 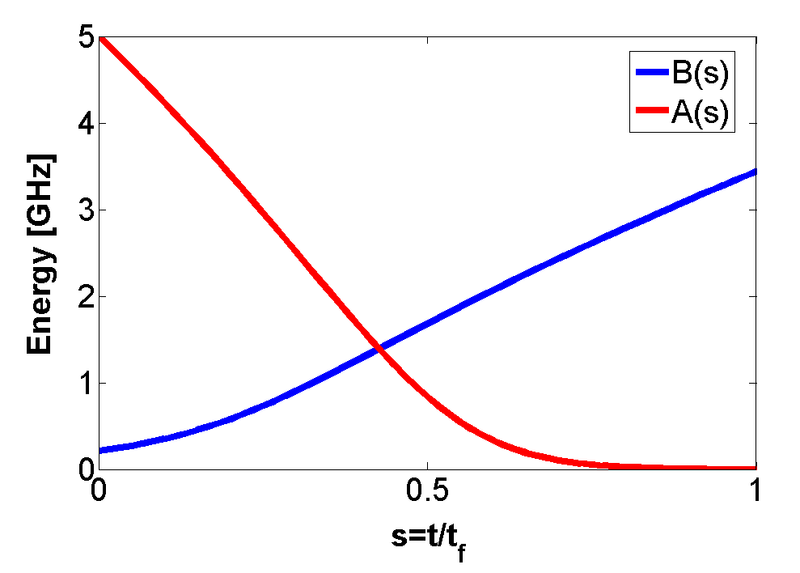 However, accurately sampling near a point in the computation where the simulation should be representing a superposition of two sets of states that are far apart from each other, e.g. when the gap in energy between the lowest two energy states is small, exactly the points we want to examine, isn’t easy. If your simulation happens to fall into one of the two sets of states, (and usually one of the two is much easier to fall into than the other), it could take a very long time to randomly walk over to the other set, meaning that the simulation might only sample from one of the two, giving completely bogus results. In order to get completely reliable results, we need to let the simulation make larger leaps… in a very controlled manner. This is accomplished by having many copies of the system, each at a different point in the computation, able to swap with each other. Carefully placing many more copies around these critical points where long distances need to be traversed is what Firas’ “Robust Parameter Selection” algorithm is all about. It’s an improvement on an algorithm by a collaborator, Helmut Katzgraber, modified to handle even these very bad cases. It’s still not perfect, since there are countless diabolical cases that can crop up, but with about a week of pre-processing on a half-dozen machines, it set up the bulk of the simulations in a round just fine. A bunch of issues cropped up in the simulation’s main crunching, and a few of them require an intimate understanding of the theory behind it just to realize what to check. One of them was a “free” parameter we hadn’t realized actually significantly impacted the accuracy of the simulation. As it turns out, at one end of its possible range, almost any problem you give it to simulate will appear to be a trivial problem, whereas at the other end, it gives a very accurate simulation… but takes forever to simulate. We had originally had it set to some value about halfway in between, where it was still quite inaccurate, but enough problems still appeared non-trivial that we didn’t clue in that something was wrong. We happened to re-run a round of the simulations with a different value, and got drastically different results… curses! So, in the end, we had to more than quadruple the size of our simulations to get accurate data, and to verify that the accuracy had roughly converged, we also ran a bunch of very slow simulations (about 4x as long again) of the smaller problems with 4x less error. With all of this expansion in the simulation size, it’s a good thing we’d improved the performance of the app so much, or we’d simply have been sunk. The following plot sums up some performance improvements, on top of improvements in the thread balancing, for the main crunching part of the app (which is now down to only about 34% of the time, so it’s no longer the bottleneck). I can’t fully express the pain of trying to sift through hundreds of thousands of huge output files trying to find ways of automatically identifying which ones represent bogus data (e.g. transmitted to/from a volunteers’ computer incorrectly, memory/disk corruption, spurious emergent behaviour in the random number generators, etc.) Every output value has to be suspect. There are a whole bunch of output values that are known to be exactly 1.0, and in the application, it’s numerically impossible for them to become any other value than 1.0. Quite possibly the only reason these values are output at all is that in something like 1 in 500 output files (or more), one or more of these values is not 1.0. Even if they’re 0.9999999 or 1.0000001, either some sort of memory or disk access was corrupted, or the CPU was computing simple operations incorrectly, or a user fiddled with the output data, etc. Note that I have strong evidence that user tampering does not account for a majority of those errors, and not just because it would take a lot of effort and would get caught by my overly-suspicious post-processing checks. Some other issues in post-processing included the combination and interpretation of extremely rough data. It wasn’t just sufficient to handle noisy data, but even mediocre post-processing required estimation of the expected amount of noise on the data returned from the simulations. That only took a few pages of scratch, but handling the dozens of special ways in which the noise can manifest itself took a few months off my lifespan. Looking at the data as a human being with a brain, it’s usually so blatantly obvious where the noise kicks in, but trying to describe it for a computer to identify takes a lot of “patience”… actually, I don’t even need the air quotes, ’cause it takes a few hours to run the post-processing code and see if it worked or not. A word of warning on the emergent behaviour in random number generators comment above, a negligibly small but non-zero probability can very easily accidentally become a 1 in 4,294,967,296 probability, which normally wouldn’t be an issue, but in huge simulations like these can cause maybe 1 in 200 output files to have a clearly unreasonable event occur that will throw off all results they’re used in. That and random number generators may randomly happen to have the same seeds if you’re not careful. Having a good way of visualizing the results was also critical in finding and understanding these issues. This has been a heck of a challenge over the past year, and I’m glad the paper on it is finally out there, showing that the median adiabatic time is really negligible for many small problem instances. There are much longer times that are more worthwhile worrying about in the mean time, e.g. milliseconds spent waiting for a chip to cool down after sending it a problem. I can’t wait until the other big paper to be out soon is finally out. That one took a solid 6 months mixed in there. A friend asked me to do a post on distributed/parallel computing. Covering everything would be a bit much for one post, so I’d first like to address one of my biggest beefs related to multi-threading. Specifically, many people have this bizarre assumption that multi-threading is difficult, perpetuated for no apparent reason by a few people who are evidently either too stubborn or too stupid to think and program at the same time (e.g. Joel Spolsky, the makers of SQLite). I hope to show in this post that there’s very little excuse for not multi-threading, since you can do a half-decent job of it with one remarkably simple, general structure and almost no effort. An interesting feature of these two parallelizations is that both of them are locally optimal, in that no single task can be moved to improve the total time in either case. All this is well and good, but how exactly would we implement something like this? This is also simple using a workpool. A workpool is effectively any producer-consumer-like structure that represents tasks to be run. One thread is created for each CPU core, and they each look for work in the pool. This can sometimes be as simple as a single integer that is the index of the next task to be done in an array of completely independent tasks. 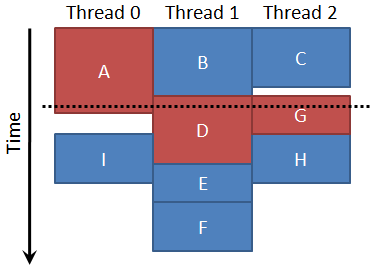 A workpool can even be completely implicit, such as when the entire being of what each thread is to do can be determined from their thread number (e.g. 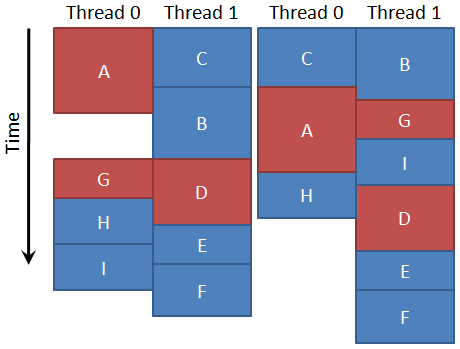 random sampling with each thread having a different seed, or each traversing a separate length of array). However, any thread-level parallelism can be expressed in terms of just a workpool, though it is often much more efficient to use other control structures as well or alternatively. The example above is actually one of the more complicated cases, where each task could have a list of tasks that depend on it (e.g. task G would have a list pointing to E, H, and I), and when the task finishes, it could decrement a counter on each of those tasks, indicating how many dependencies it’s waiting for. If the number of dependencies some task is waiting for reaches zero, it can be added to the workpool. Then, if there are any, some task from the workpool would be chosen to run in the current thread. All of the above parallelizations can be obtained by that general workpool algorithm. There are even some impressive properties that have been proven about workpools. For example, if all of the tasks take the same time (in practice, if variation in task length is very small compared to the total time), any way of selecting tasks from the workpool will be at most 2x slower than the best, no matter what the dependencies, and on average, should be much better than that. If there are few dependencies and a very large number of tasks, it becomes easy to obtain near-perfect speedup on many CPU cores. There is a small caveat, for those paying close attention, and it’s from unintended dependencies. For example, something as simple as decrementing the counter of how many tasks to wait for causes dependencies. What if two threads try to decrement the counter at the same time? Both read the value 5, subtract 1, and store the value 4, but if they’d been just a few clock cycles apart in timing, the value of the counter would be 3, since whichever one occurred second effectively depended on whichever one occurred first. Worse yet is the multi-instruction operation of “adding a task to the workpool”. This requires a mechanism for performing atomic operations, ones that cannot be divided into separate operations or overlapped by dependent operations. Luckily, Intel and AMD provide an instruction prefix (the “lock” prefix) to make certain processor instructions atomic. With these, we can construct multi-instruction atomic operations, a workpool, any other thread control mechanism, or even a thread scheduler, which doesn’t have the luxury of having its own thread. Nonetheless, with just a functioning workpool implementation, it’s possible to do amazing stuff in parallel. It very simply (i.e. 1 line of code and a bit of forethought) cuts down the post-processing time of AQUA@Home from over a day to a few hours on a Core i7 (8 logical CPU cores). Workpools of some sort are also used in some form for all parallelism in the AQUA@Home applications. With a careful way of selecting the next thing to run from a workpool, I can guarantee that one of the applications now spends at most ~10 seconds at the end not using all CPU cores 100%. I also parallelized assembling down to the function level just by putting all the functions into a type of workpool in Inventor IDE. I haven’t shown detail on a specific example here, but next time, I’ll walk through the parallelism of the main AQUA@Home application, presented in this paper I co-authored. The preprint version of my first paper as a lead author is now out here. It’s been submitted to Parallel Computing for peer review. The paper walks through several optimizations I did on the AQUA@Home Quantum Monte Carlo simulation code, independent of multi-threading. The journal encourages authors to include multimedia too, so I’m looking into making brief tutorial videos (<5 minutes each) describing the optimizations. The main conclusions are: 1) it is sometimes possible to achieve large speedups from explicitly optimizing code on both CPU and GPU, 2) it is sometimes possible for a CPU to outperform a GPU when both are running optimized code. I’ll start with the 2nd one, since it’s probably more controversial, and hence the most likely to result in angry emails or blog posts attacking my credibility. How on earth can a high-end CPU with 8 logical cores outperform a high-end GPU with 240 cores by a factor of 2.04, when data transfer time is negligible? This means that the performance of each CPU core would have to be comparable to the performance of 61.2 GPU cores in this application; a huge discrepancy to account for. This isn’t rigorous, but it goes through the primary factors involved. Factor #1: Clock Speed. The cores on the Intel Core i7 I used in the paper run at 3.2 GHz (I turned off overclocking, since it ironically made the graphics card flake out.) The cores on the GTX-285 run at 648 MHz, faster than the GTX-295, in case you’re wondering. That’s a factor of 4.94, still a discrepancy of 12.39x left. Factor #2: Vector vs. Scalar. Each core on the CPU spends the bulk of its time running instructions that do 4 operations at once on a vector. Each GPU instruction only does 1 operation. 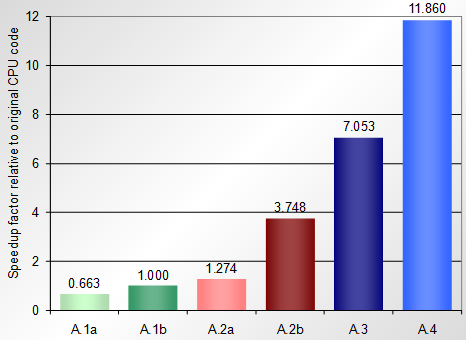 That factor of 4 leaves a discrepancy of 3.10x. 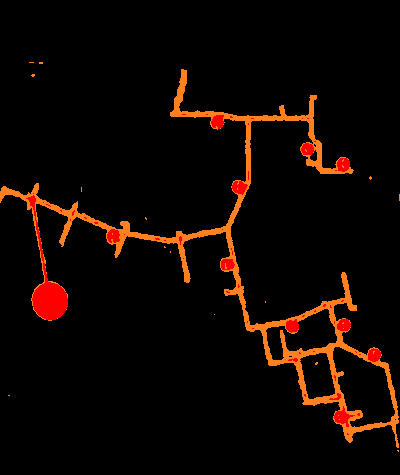 Factor #3: Branching. In the scalar version of the code, there’s a key branch choosing whether or not to flip the sign of a variable and update data for related variables, which is taken 28.6% of the time on average. However, if looking at 4 variables at once, if any one of them takes the branch, they must all wait, making the average probability 56.8% (computed from 115 separate probabilities, Figure 14, which is why it’s not ). For the GPU, with groups of 32 threads (called warps) sharing an instruction pointer, they must wait 82.8% of the time. This would be another factor of 1.46 (i.e. 82.8%/56.8%), but not all of the time is spent on that branch, so without knowing the breakdown of which parts took how long, one can’t be sure how much it contributes. Factor #4: Clocks Per Instruction. This is actually many factors, but difficult to separate. The L3 cache on the Core i7 is 8MB, enough to hold some of the key data structures. On the GTX-285, the similar “shared memory” on each multi-processor is only 16KB (and manually-controlled, unlike cache), meaning that the key data structures must reside in the “device memory”, which is considerably slower, analogous to main memory from the CPU’s perspective. Also, each core of the Core i7 has multiple execution units, so it can be running multiple operations simultaneously, resulting in max throughput of 3 vector bit manipulation instructions in a single CPU clock cycle. I couldn’t find reliable clock cycle numbers for the GTX-285, but each core has only one execution unit. Although factors #3 and #4 are not rigorous, they could reasonably account for the remaining 3.10x discrepancy. 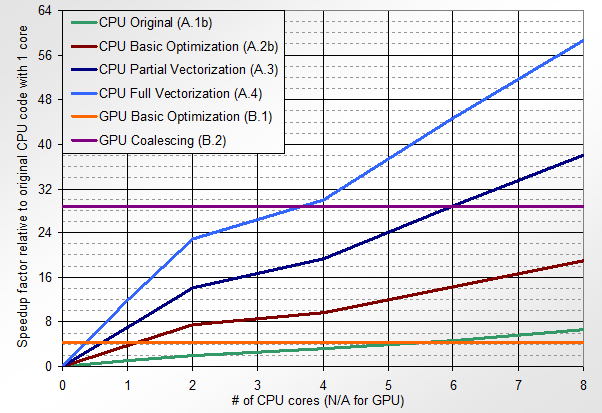 Note that factors #3 and #4 are highly application-dependent, so it would be unwise to claim that this 61.2x core-per-core performance difference applies to more than this application, but one can at least account for a 19.75x difference, from factors #1 and #2, assuming the CPU code is vectorized. To make sure it’s absolutely clear, I’m not stating that a CPU is generally faster than a GPU, I’m stating that a GPU is not always faster than a CPU, and that comparing numbers of cores isn’t a good metric. As shown by the difference between A.1a and A.1b in the bar graph above, compiler optimizations gave a 1.51x speedup for the original code. It’s certainly nothing to sneeze at when the simulations take months to run on over 2,000 computers, but by using knowledge about the problem and algorithm at hand, as well as about the CPU’s available computing resources, it was possible to get the final 11.86x speedup on top of that. In implementation A.2a and A.2b, I wrote the random number generation code in a way that it would be easier for the compiler to vectorize, and it gave a 2.94x speedup from compiler optimizations instead of 1.51x, so it can vectorize when it’s given a chance. I’m not “beating the compiler [at a fair fight]”, since the compiler doesn’t have a hope of guessing what I know about the problem, let alone using that knowledge. This is one of the reasons why I find the term “optimizing compiler” rather outrageous. It suggests to developers that there’s no point in optimizing, since the compiler’s already done it for them. The claims made about compilers that automagically parallelize code are even more outrageous. If you need your code to run much faster and can’t count on that many times more cores or computers, you may not be out of luck. People are pretty skeptical when I talk about getting big speedups from simple changes, so when optimizing/debugging the program I made recently to generate tough problem instances of Maximum Independent Set (MIS), I timed how long the generator took on one CPU core of my 1.66GHz Core 2 Duo laptop. The program starts with a random graph that very likely has an independent set of size m, keeps the first independent set of size m that it finds, and adds edges as it searches so that the first one is the only independent set of size m. There are many papers out there on hiding independent sets (or cliques) that are much larger than most in graphs, but this is the first I’ve heard of hiding an independent set that’s only one node larger than most of the maximal independent sets. I set out with the objective of getting 128-node graphs with a single maximum independent set of size 24. This isn’t even doing any “real” optimizations; it was spending 99.997% of the time just printing out data. Speedup from not printing out anything and using release build: 32345x. In fact, the final result is so much shorter, that much of its time could be overhead, so the speedup on a larger instance would be higher. I consider this like a design optimization, whereas the optimizations below are algorithmic optimizations. I find that design optimizations usually have the largest impact and result in simpler code, though in this case the code wasn’t really much simpler since it wasn’t really a full-out design change. Design changes are almost always of the type “I don’t need to do all this stuff… why am I doing it anyway?” Moral of the story: printing text is ridiculously slow; avoid unnecessary logging. This was the first “real” optimization I tried, and it didn’t work. The search is highly recursive and has 10 parameters, most of which don’t change, so I was thinking that passing them together in a structure would be better, but it wasn’t. The overhead of accessing them indirectly outweighted the savings from only passing 4 parameters. Moral of the story: even for functions with a ton of parameters, function calling is fast; it’s the content of the function that matters… as long as it isn’t a tiny function. That helped too. Speedup from early cut-off: 5x. Moral of the story: don’t compute things that you don’t need to, as long as it’s easy to check whether you need to compute them or not. It’s by no means rigorous, as things that are “approximately equal” put through certain transformations can result in values that are not even close, but it seems to check out in this case. Now that my honours project is over, I’ve been busy catching up on other things, including the Assembly Language Video Tutorial and a new Performance Optimization Tutorial. The assembly tutorial now has two more videos, one showing how to do a 3×3 Gaussian blur in a very simple way, and one showing how to identify red and orange in the image. Edit: There’s a second video of the optimization tutorial out now. I’m hoping to make this a weekly thing, or at least releasing a video in one of the tutorials each week. If it’s the minimum of many independent variables, it’s then . So, as long as we can find the value a at percentile p of the original distribution, we’ve found the median of this distribution of the minimum. Weird stuff.